Western blot analysis of extracts from various cell lines using AGPAT2 (D8W9B) Rabbit mAb. 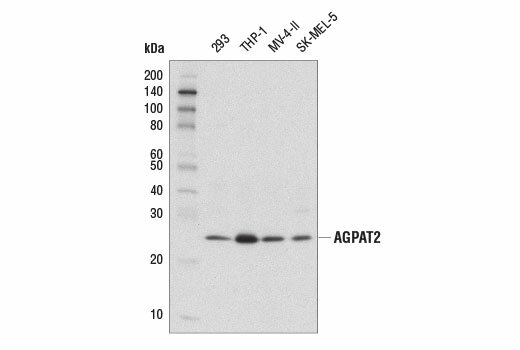 AGPAT2 (D8W9B) Rabbit mAb recognizes endogenous levels of total AGPAT2 protein. Monoclonal antibody is produced by immunizing animals with a synthetic peptide corresponding to residues surrounding Gly235 of human AGPAT2 protein. The 1-acylglycerol-3-phosphate-O-acyltransferase 2 enzyme (AGPAT2) catalyzes the acylation of lysophosphatidic acid (LPA) into phosphatidic acid (PA), which is a precursor for the synthesis of triacylglycerol and phospholipid (1,2). AGPAT2 is highly expressed in adipose tissues, liver, and skeletal muscle (3). The induced knockdown of AGPAT2 expression results in decreased expression of adipogenic proteins and delayed expression of adipogenic marker proteins, suggesting that AGPAT2 plays an important role in adipocyte growth and differentiation (4). Mutations in the corresponding AGPAT2 gene cause autosomal recessive congenital generalized lipodystrophy type 1 (CGL1), also described as Berardinelli-Seip syndrome. Patients with CGL1 are born without detectable white adipose tissue and tend to develop severe insulin resistance, hypertriglyceridemia, and type 2 diabetes during childhood (5,6). Yamashita, A. et al. (2014) Biology (Basel) 3, 801-30. Agarwal, A.K. et al. (2011) J Biol Chem 286, 37676-91. Leung, D.W. (2001) Front Biosci 6, D944-53. Gale, S.E. et al. (2006) J Biol Chem 281, 11082-9. Agarwal, A.K. et al. (2002) Nat Genet 31, 21-3. Subauste, A.R. et al. (2012) Diabetes 61, 2922-31.